We already knew that Nehalem would have different sockets for the already released Core i7 enthusiast line and the upcoming mainstream parts. It appears the upcoming CPUs will be spread over three sockets. And Intel is squeezing in 32nm along the way. AMD seems to have learned its lesson, and is building a lot of backwards compatibility into its AM3 CPUs. 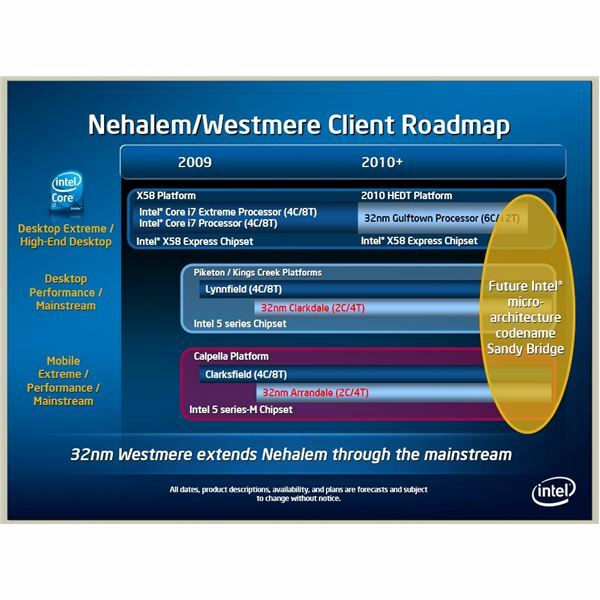 Intel, which has benefited immensely from the ubiquity of LGA 775, has decided that the best way to roll out Nehalem is across three different sockets, on the consumer desktop side alone. We already have the Core i7 line, which uses an LGA 1336 socket. They are enthusiast products and run on the equally extreme X58 Tylersburg platform. Of interest, this is the same socket used by Nehalem server chips. We knew the midrange chips, Lynnfield and Havendale, would use a different socket, presumably LGA 1156. Recently, Intel announced that they would be pouring $7 billion into facilities to build 32nm chips. What with the rough economy, this was taken with a lot of fanfare. The problem is, the upgrade path for users is less than clear. Picking a socket is bad enough when you are trying to decide between a new, more expensive, but more upgradable platform; or an older and cheaper one. The move to Nehalem was difficult enough to plan before we discovered we would be choosing from two incompatible hardware platforms. LGA 1336, as the enthusiast socket, is the obvious choice for the deep-pocketed user. The problem is, as a server product, your paying for things you will never need, like the ability to have a second Quick Path Interconnect that connects to a second CPU that isn’t there. Even with a big budget, that kind of thing is irksome. Those with more modest budgets figured they could sit tight and wait for Nehalem at the mainstream level on the Ibex Peak platform. It would use a LGA 1156 socket, and you would never be able to upgrade to a Core i7 or get triple-channel memory benefits. But you wouldn’t have to pay for three sticks of memory, or worse yet, the hidden cost of the extra, useless, QPI in the socket. Even this was slightly simplistic, since the Tylersburg and Ibex Peak platforms differ in a lot more than socket and memory set up. We’ll discuss this in a coming article. For now, we have a more blatant complication. 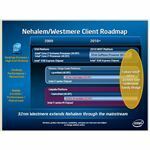 Intel’s plan to stay on their famous tick-tock schedule (apparantly even if the products resulting from it aren't in demand), with at least a few 32nm parts out the door by year’s end, has resulted in changes to the mainstream Nehalem roll out, on desk and laptop. 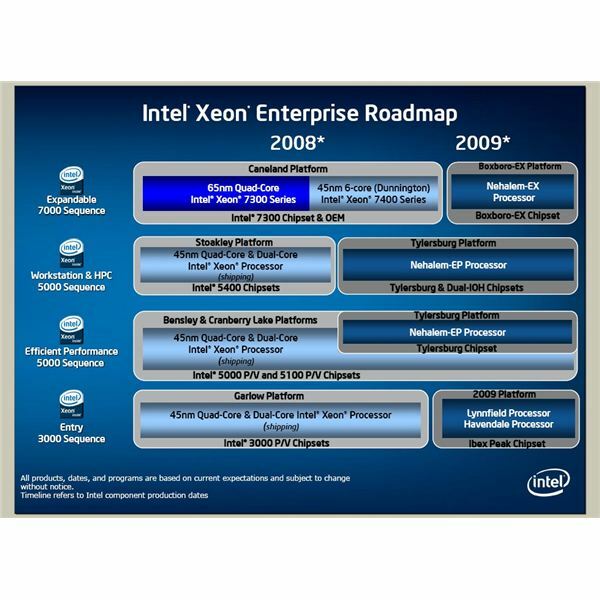 Originally, Lynnfield (4 core) and Havendale (2 core) Nehalem CPU’s were expected in Q3 ’09 for the desktop, along with Clarksfield and Auburndale laptop versions. In order to get 32nm chips out, Havendale and Auburndale chips have been dropped. The Lynnfield and Clarksfield will roll out as planned, the latter on the expected 1156 socket. We discuss what is known about the Lynnfiled Nehalem here. 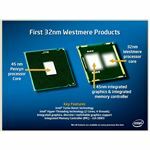 The first 2 core Nehalems, Clarkdale (desktop) and Arrandale (laptop) will also be the first 32 nm, or Westmere, CPUs from Intel. The reasoning for this is likely tied to Intel taking advantage of the smaller cores to squeeze integrated graphics onto the 2 core processors. Actually, that still doesn’t make sense. New technology, like the Nehalem family in general usually starts out at the enthusiast level. People who get by with integrated graphics can also get by with 45 or even 60nm chips. All else being equal, the smaller process chips would higher up the performance totem pole. Starting them out at the low end is a curious move. This is complicated by the fact that the chips with integrated graphics have fewer cores. Day to day computer use doesn’t require Nehalem horsepower, and gamers can largely ignore number of cores and threads in favour of higher clocked or cheaper processors. But gamers always run dedicated graphics. This appears to add another unattractive consideration to Nehalem upgrades for gaming PC fans: you have to choose between paying for an extra four threads that won’t really help, or integrated graphics you’ll likely never use. More on the first 32nm chips will be revealed as time goes on. For now, what does seem to be taking place is a further complication for Intel users. It looks like Intel has cooked up a third desktop socket, LGA 1155, for the CPUs with integrated graphics. The LGA 1157 socket is for entry level servers, so it isn’t really an added headache for desktop buyers. It is worth pointing out though, that Intel hasn’t made anything easier for server customers either, as there are three sockets to chose from on that side as well. Yup, Intel has decided that people who want integrated graphics, and anyone buying or receiving the part second hand, will always want them. People who want to run a graphics card will never decide to upgrade and use the old board for something else that benefits from integrated graphics. People don’t buy a midrange CPU then upgrade to an enthusiast one, either. Or make due with dedicated graphics until they can buy a card. If you disagree with this analysis, you’re not alone. Forum users have expressed little enthusiasm about the socket situation. That’s not entirely true, actually, many have been very enthusiastic in expressing their displeasure. My personal favourite goes to FordGT90Concept at techpowerup.com with “I think Phelps isn’t the only one using a bong…"
This many sockets also draws attention to the fact that the two families that do share a socket, have little in common. Or at least they shouldn’t. A server isn’t just a really fast desktop computer in a rack; it handles data differently and performs different tasks than a PC. One would think a performance and enthusiast PC have more in common than an enthusiast PC and a mid range server, but that is not the way the sockets breakdown. LGA 1336 houses existing Core i7 enthusiast desktop CPUs, and it is believed it will also be used in pairs for server boards that will take two Nehalems. If one socket can do both of those, it’s a real shame it can’t handle less powerful desktop CPUs as well. Despite these differences, the LGA 1155 and 1156 socket chipsets will share many other features and a common platform name. We cover the Ibex Peak platform, and the included P,Q, and H Series 5 chipsets here. So 32nm Is Only on LGA 1155? That’s what it looks like to start off. Intel will have a 6 core, 32nm, Core i7, called Gulftown, out in the first half of next year. 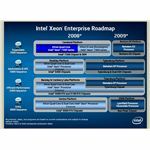 The roadmaps indicate it will use the existing X58 platform. Hopefully they will be fully compatible with existing motherboards with no more than a bios update. Not that many people buy a CPU every year, but even fewer will buy a whole, new, top of the line, system. We can say the same for 32nm on the as yet unnamed or scheduled Lynnfield replacement. If getting a new motherboard every year is unattractive to the enthusiast, performance and mainstream buyers guffaw at the notion. The LGA 1156 boards, and by extension will be untouchable until Intel states that they will run 32nm chips, so will the Lynnfield CPUs. 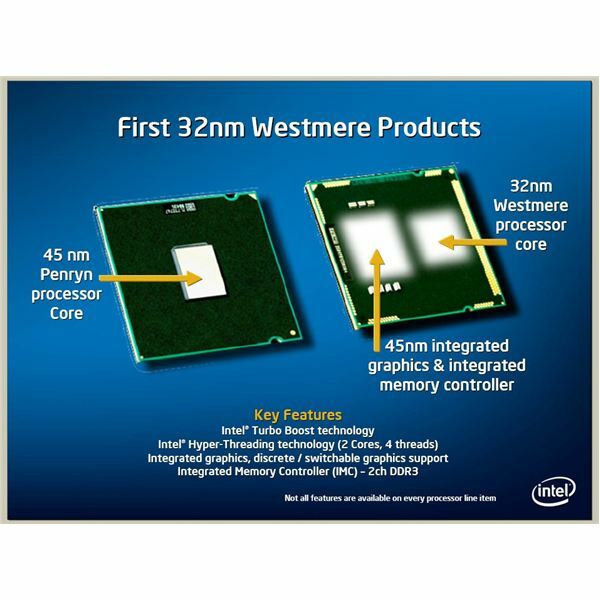 Their 4-series chipset handled the 45nm Penryn roll out well, so hopefully Intel gets this part right with the 5 series. This is less of an issue in the mobile market (which we will discuss soon) since laptop users are less concerned with upgradability.